We see them everyday and most people will use them most days of the week for heating, roasting and baking. But few people actually question the ins and outs of an oven, by that we mean the inner electrical functions which transforms raw or partially cooked food in to hot, ready-to-eat food for the table. To find out, let’s explore two common types of ovens: electric and gas. These types of ovens can come as fan-assisted or as standard electric ovens. Fan-assisted ovens cook food a lot quicker than standard electric ovens as the fan distributes the heat evenly around the oven. This decreases the necessary overall cooking time for any type of food. How Does An Electric Oven Work? An electric oven uses two sets of large coil wires which heat up when electricity is sent in to them. To get the oven started you must first plug it in to an electricity source, then set the temperature and cooking time using the mechanical dial or electronic control. The dial on the oven controls an internal thermostat. When you turn it to set the temperature, a copper wire that leads to the cooking area is alerted to the temperature which you have set. This notifies the bottom coil of wires which also regulates the internal temperature of the oven by sending signals to the thermostat to turn on and off, based on the internal temperature of the oven. The bottom coil of wires is normally used for baking as it functions differently from the top coils of wires. The top heating coil is called a broiler. This is designed to cook food from top to bottom. Unlike the bottom set of coils, it does not have a temperature control and will heat up to the highest temperature until it is manually switched off. Other features of an electric oven are fairly self-explanatory. The timer on an electric oven lets you bake or broil for a desired amount of time. Most modern electric ovens will also have a self-cleaning function which heats the elements to high temperatures so that any residue in the interior turns to dust. Gas ovens work in a slightly different way to electric ovens. Firstly they are powered by natural gas which flows through a burner at the bottom of the oven, when the temperature knob is turned. A cooker ignition needs to be pressed so that a spark is generated which lights the flame. 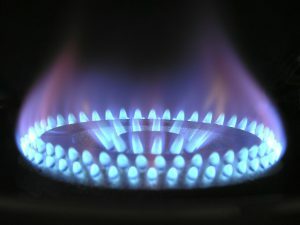 Sometimes the ignition is also located on the temperature knob, which is normally pushed inwards to release the gas and turned to set the temperature once the flame is lit. There is a copper wire at the bottom of the oven which acts as a temperature gauge. This regulates the temperature of the oven by turning the burner off when the oven gets too hot, when the temperature dips it switches the burner back on again. Similarly to the electric oven, most gas ovens have a flame at the top of the cooking area which acts as a broiler. Although gas ovens are more economical to run – gas is cheaper than electricity – often food takes longer to cook as the fans in electric ovens mean that heat is more evenly distributed and ensures a more even cook. If you are looking for someone to perform oven repairs in North London, then look no further. Whether you own a gas or electric oven doesn’t matter. 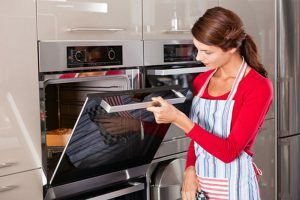 Our expert repairers have a lot of experience in cleaning, fixing and (if needs be) replacing ovens. Thousands of services add up to a great deal of know-how. What’s more we can travel anywhere in and around North London, which saves you time and money.